In a time when Humble Bundles are born on a weekly basis and the idea of giving money to charity in return for gaming goodness is no longer a novel one, it takes something different to stand out from the crowd of other philanthrotainment, a word I just made up and immediately hate. 1) They were all made by notable development studios. 2) They’re all exclusive to this compilation. 3) They were all made in just six days. Promoted by publisher Sega as a “global game jam”, the HELP: The Game project saw 11 different development studios making a full game in a shorter time than it took me to reach level 10 in Pokemon Go. All the profits made from this bundle will go to War Child, the charity for children affected by war. As you’d expect, the short timescale means two things: games that aren’t always the most polished in the world, but games that therefore have to rely on unique ideas rather than spectacle. Does it manage this? Well, yer man Scullion has played all 12 games ahead of release so here’s my verdict on them. 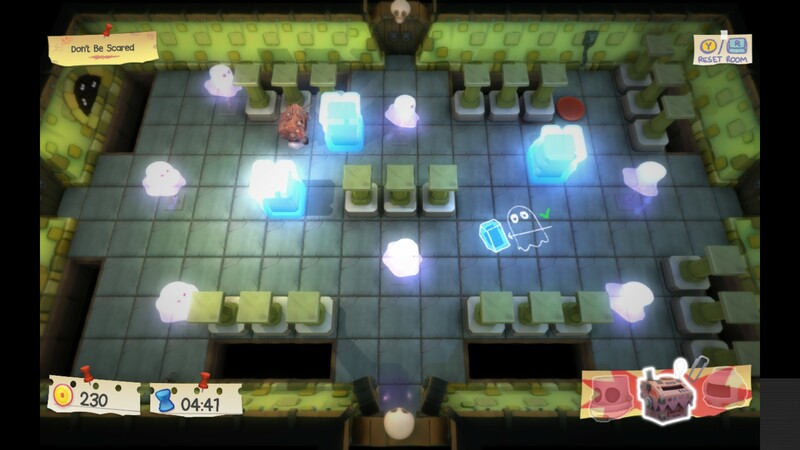 10-Minute Tower is a cute old-school single-screen maze game. You play as a little cardboard box robot who has to get out of a maze of rooms, mainly by pushing blocks onto switches. Eventually you unlock different heads which let you turn into an astronaut (so you can jump over gaps and blocks) and a knight (so you can destroy certain objects blocking your way). The twist is that, as the title suggests, you only have 10 minutes to get as far as you can and the room layout is randomly generated every time you play. The only real annoyance is when you find information boards that display info on War Child. While these are of course extremely important, the default option when you read one is to share it on Twitter so when you instinctively press A to come out of it you open a web browser instead. Ultimately I ended up avoiding them because it wasn’t worth the hassle, which means the important messages they contained went unread. This aside, 10-Minute Tower is a fun little diversion. 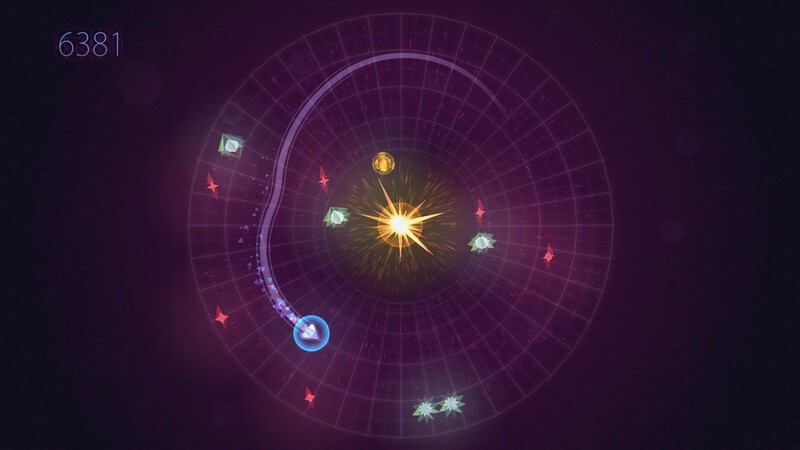 A sort of cross between Geometry Wars and a descent into madness, Anthelion takes place on a circular map in which your ship is orbiting around a giant yellow sun, constantly being drawn towards it. If you hold the A button your ship will use its booster to move further away from the sun, and if you let go it’ll be pulled back towards it. Also orbiting the sun alongside you are a bunch of green and red stars: the aim is to collect as many of the former as possible while avoiding the latter. This has that same infuriating “fuuuuuuuck this game, okay let’s try again” feeling you get from Geometry Wars and Super Hexagon, and the different power-ups that appear are satisfying (the slow-mo one makes you properly feel like Neo. From the first Matrix, mind, not the shite ones). The odd bug aside – the menu tells you to press the B button for a help screen but it quits out instead – this is an insanely addictive game and its one-button control scheme means I’d be up for a mobile port some time in the future once this compilation raises all the money it can. 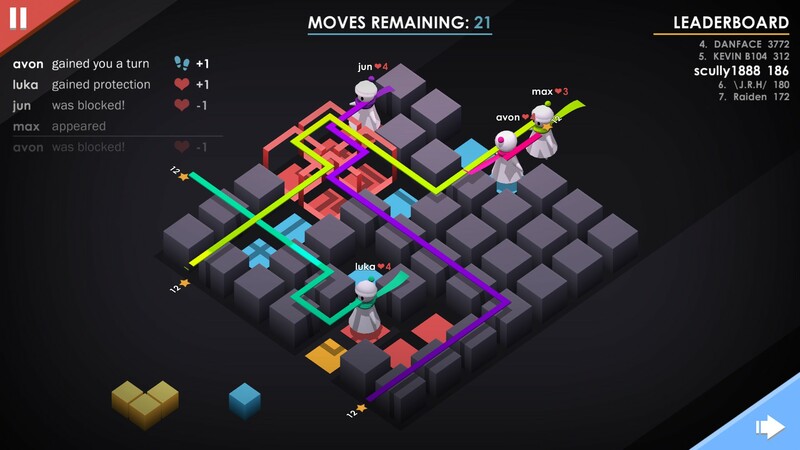 An interesting little puzzler that feels a bit like Tetris mixed with a turn-based dungeon-crawler. Your aim is to guide a bunch of little dudes across a bunch of set paths by choosing from three randomly selected blocks and dropping them in front of them. The blocks can raise or lower walls on a grid, and after time lowered ones raise again, so as more little guys start entering the grid the whole thing becomes a glorious mess of colour and blocks. Extra strategy is added in that the colour of the blocks you drop determines whether your little guy gets you extra points, health or turns, so balancing all three is key to lasting as long as possible. 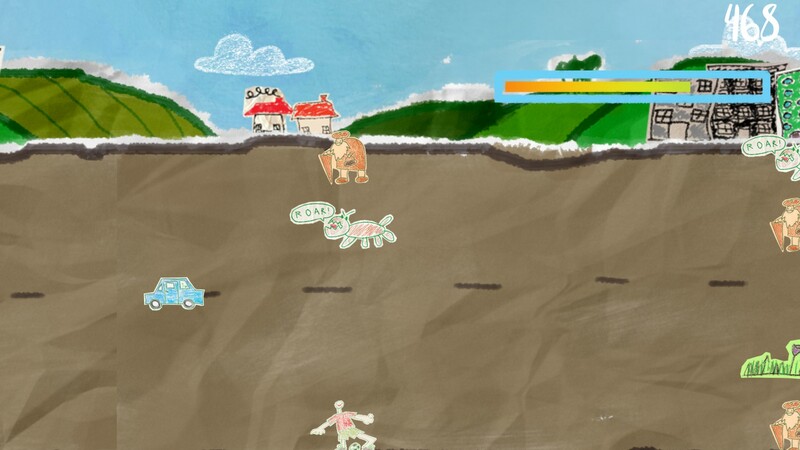 This one deliberately tries to look like a bad game, but unfortunately it plays like one too. The aim is to last as long as possible by weaving your way through five lanes of obstacles while taking part in mini-games to keep your ‘imagination fuel’ (your timer) topped up. The mini-games are all rubbish – type a word within a certain time, press the space bar to catch an egg in a basket etc – and other than the cool chiptune music and the admittedly funny handdrawn art style, this is easily the weakest game in the series. Well, the weakest that actually is a game – more on that later. 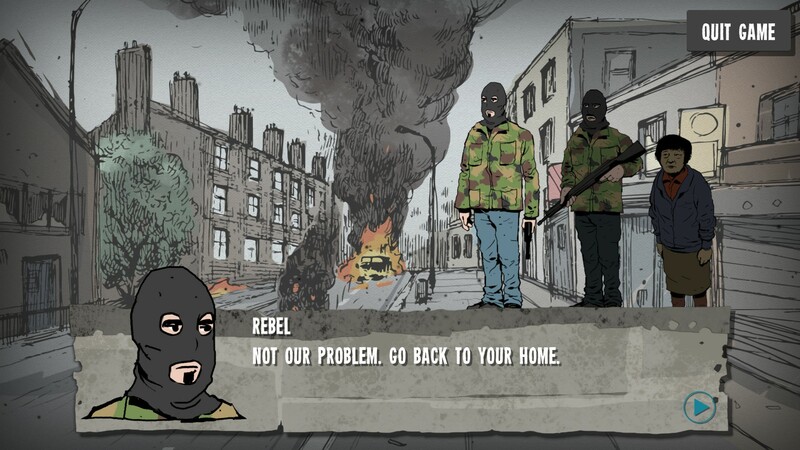 This is a basic visual novel set in an unnamed country where an uprising has just taken place. You pay as Emily, a young girl who – along with her parents and her dog – are suddenly thrown into a civil war. It’s a short three-chapter story and you don’t have much interaction other than a few multiple choice decisions which determine which narrative path you go down, but with three different endings it should keep you busy for half an hour or so. 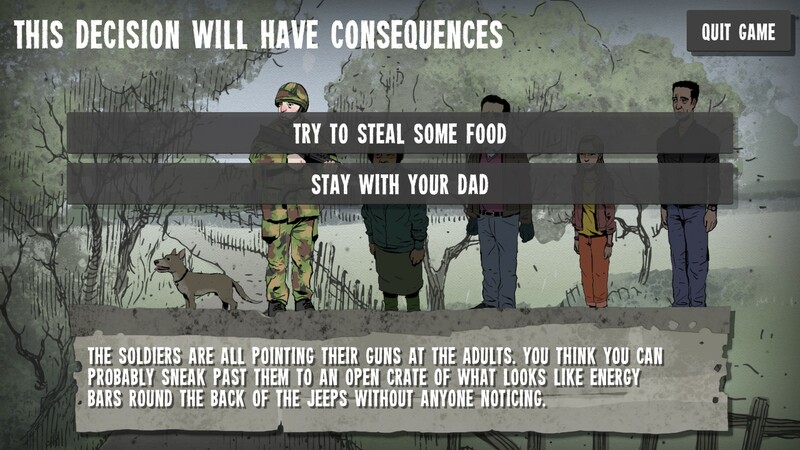 The writing in this game is very basic so it won’t really keep adult gamers hooked, but this does makes it an ideal game for you to play with your children to show them how other kids are affected in war-torn countries. Probably the most time-consuming of the games on offer, Malkia is essentially an African village shopkeeper simulator (a hotly contested genre, I know). You play as Malkia, a woman living in an African village with eight children and $3 to her name. The aim is to build your stocks of coal and root (and later gas and petrol), selling them at a profit and eventually earning enough to pay for your children’s school fees, better food, security and transportation so you don’t have to walk 30+ km every time you want to stock up on supplies. 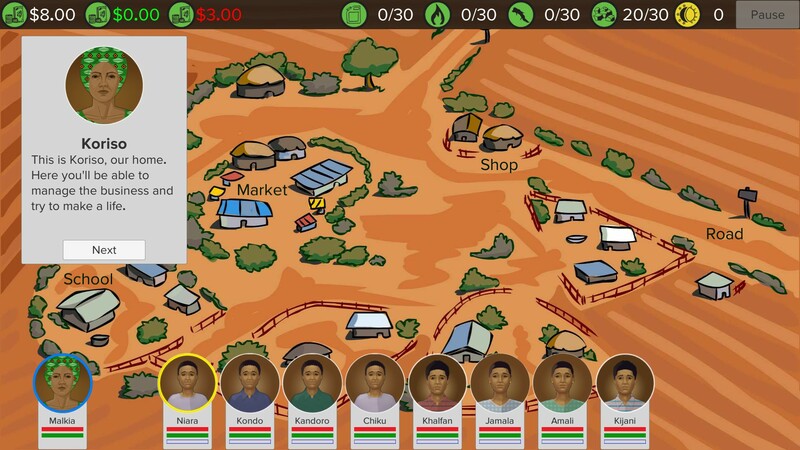 It’s oddly addictive and rather unsurprisingly, given the subject matter, it’s bloody hard to succeed, even when War Child turns up a couple of days in to give you a $30 loan (see, the point of the game is to show how War Child gets folk started in rebuilding their lives). It looks basic, but I got properly hooked on this one. This one really doesn’t count as a game. It’s essentially a painfully slow point-and-click experience in which you control a young girl from Mozambique called Helana. You make her fetch water, talk to aid workers then go to school, while she tells you stories of what it’s like in Africa. Then the screen goes black, her village is attacked and that’s the end. The whole thing took me seven minutes. As an interactive message (albeit one that’s told at a snail’s pace) it serves its purpose but in no way should this be considered a ‘game’ as such. 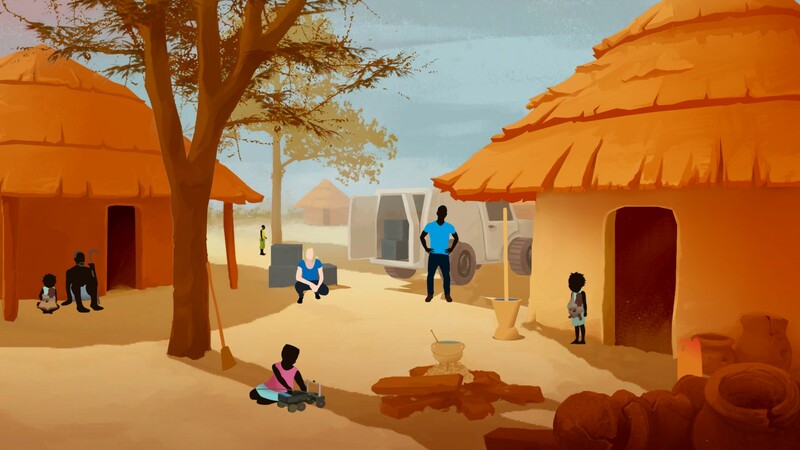 This is an original little game where you have to roll a giant ball called a Mine Kafon around an African countryside, detonating the unexploded mines that are still there causing a danger to children. When you run over a mine it blows you in the direction the camera is facing, meaning there’s plenty of mouse-based camera spinnery going on to ensure you clear the field as quickly as possible. 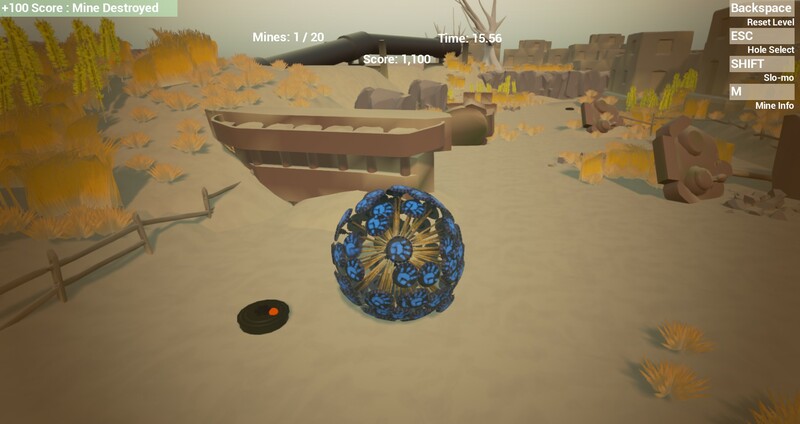 The Mine Kafon is actually a real thing which is powered by the wind to clear mine fields, so that’s something I learned while playing this game. I quite like this one, and it’s pretty tricky too so clearing its eight levels will take you a little while. Sumo’s offering is a basic match-three game in which you click sets of three or more similarly-coloured alien things to make them disappear, at which point they’re replaced with other randomly coloured aliens. There’s no tutorial, no instructions and no real indication as to why the board keeps switching even when there are more moves available. I also don’t know how I was extending the game’s timer – I know I was doing it, I just don’t know how. There’s still something quite cathartic to switching the brain off and clicking loads of little aliens but don’t expect to be figuring out any massive strategies for this one, it’s about as simplistic as you’ll get. 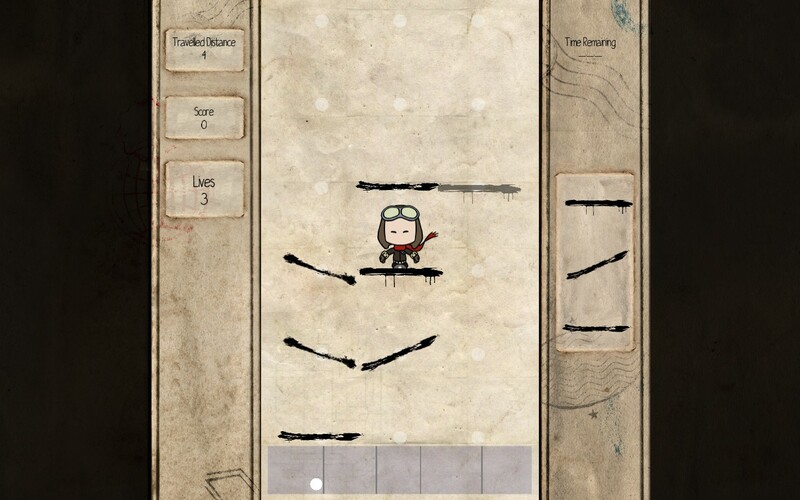 Here’s an interesting mixture of Doodle Jump and rhythm action. Rise has you trying to make a pilot jump as high as he can by placing platforms above him for him to jump onto. There are two catches, though. 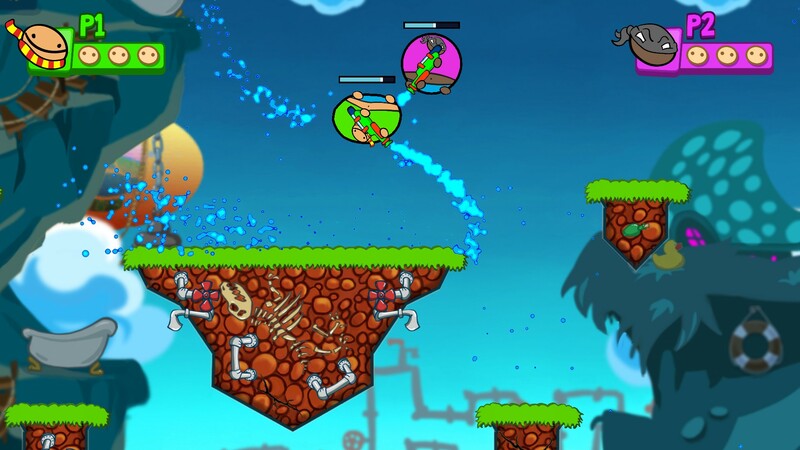 The first is that the platforms come in three different angles, which make him jump either straight up or to the side. If you make him jump to the side and you don’t have a platform ready for him to land on, he’ll fall to his doom. The other twist is that his jumping is controlled by the beat of the music – sometimes it’ll be a slow, methodical pace giving you time to think about where to place your platforms, then suddenly there may be a brief musical flurry causing him to hop a few times in quick succession. The game also lets you upload your own songs (in OGG format) and generates jump timings based on them. Pro tip: the Twin Peaks theme is impossible because he doesn’t jump fast enough and the platforms disappear eventually. 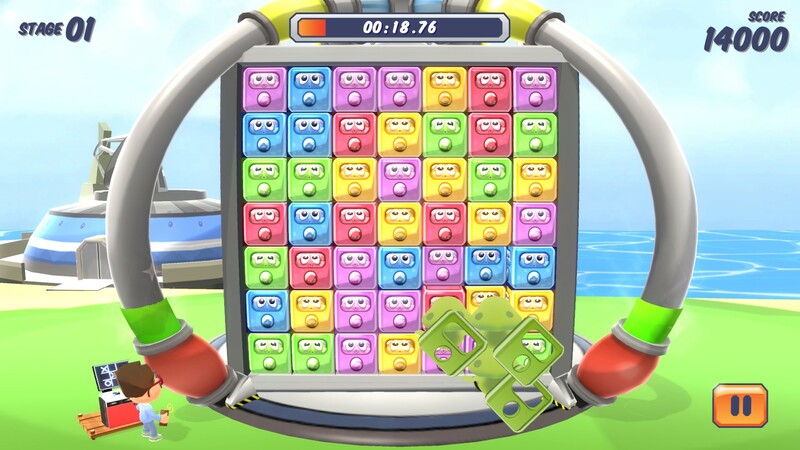 Rovio’s second game in the set is a competitive multiplayer game (though you can play against the CPU) in which up to four massive round chaps armed with water guns have to spray themselves around a randomly generated, suspiciously Worms-like stage, trying to bump each other into the sea below. The water spray acts as jet propulsion, so you have to fire it in the opposite direction to navigate around the stage. It does run out though, so you have to use it in short bursts and wait for it to recharge. While this one loses its steam a little when you’re playing it solo, with a friend it’s daft fun and should keep you entertained for a little while. I’ve never understood the fascination with farming games, but if you’re into them then A Verdant Hue is certainly one of them. To its credit the music is lovely and the gameplay is solid enough considering how long the devs had to make it, so if hoeing the dirt, planting seeds, watering them and selling them yanks your crank then you’ll get what you’re looking for here. 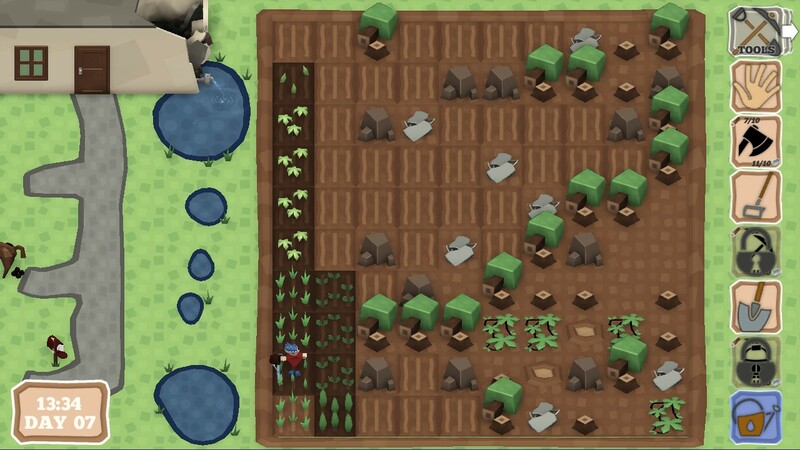 For a six-day-old game it’s an accomplished effort and while it’s a slow burner it does eventually get quite satisfying when your farm starts to take shape. So, is HELP: The Game worth buying? Look, regardless of the quality of the games the answer is of course ‘yes’. You’re not buying a compilation of games here, you’re giving a tenner to children affected by war and getting some fun little diversions by way of a thank you. The quality wildly varies – there are a couple of little gems in there and, frankly, some absolute stinkers – but given they took just six days to make if you were expecting Super Mario Galaxy (or even Sunshine) then you’re perhaps being a tad unrealistic. This bundle will be of most interest to budding developers, who may be inspired by these twelve examples (well, eleven examples and whatever Savana counts as) of just what’s possible in less than a working week. Ultimately though, if you’ve got a tenner spare you should really buy it anyway. Even if only one of the twelve games on offer keeps your interest for a while – for me it was 10-Minute Tower, Anthelion and Malkia – then it’s a worthwhile purchase. But more importantly, it’s for a worthy cause. HELP: The Game is available for download on Steam, priced £9.99. All profits go to War Child to help children affected by war. Disclaimer: In order that I could write this review in advance of the game’s release, I received a free code from its publisher. The content of my review and the opinions therein were in no way influenced by this, and I will be making a separate donation to War Child to ensure it doesn’t miss out on my donation as a result of me receiving the game at no cost. I can easily see myself losing some hours on Malkia too. Given that it’s from Sports Interactive (which are long-time supporters of War Child, BTW), no surprises there. And Bossa, of all studios, making something as dark as Emily: Displaced is one hell of a twist.